More stuff I never knew - I never realized how much I was missing! I'll be doing this for my next pile of prewashing. I've always just thrown it in the machine, at most zigzagging the cut edges first so my entire yardage didn't unravel. I had a student in my studio for her first tailoring lesson, and she helped me prepare some fabric for pre-washing. Even though she is a fairly accomplished sewist, she was fascinated by my "soap potion" way of washing yardage, LOL! Based on her interest, I decided to write this article....I am glad you found it useful. Interesting, I'll have to try this next time. I always wondered how I could avoid the tangled twisted mess that I usually pull from my front loader. Why do I think this will also reduce the amount of pressing my yardage needs before I can cut? Thank you. I washed 4 1/2 yards of quilting cotton, machine basted all open edges. Beautiful, flat fabric when it came out of the dryer ( barely damp). Terrific Frank! I am glad to be able to add to your collection of sewing techniques. ...and thanx for the compliment. It's too late for all those pieces that twisted into horrible ropes, however, I'm pretty sure I'll be buying more fabric, ha, ha, ha. Thanks for the tip. No matter how long you've been sewing, you can always learn new things. 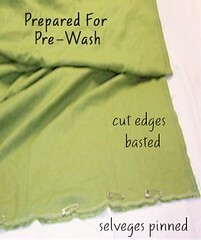 I definitely will use this method with my next piece of fabric that I pre-wash. I tried this last time I washed some new material. Works great. Thanks. We can always learn new things even if we've sewed many years.